“Should we try it?” my wife and I said to each other, apprehension on our faces. All around us stood old babushkas, heads covered in checkered red scarves, the deep canyons that covered their haggard faces indicative of the cold, hard life of Siberia. Each stood behind their wooden stands, lined up one after another, hawking the same thing: smoked omul. As we walked through this makeshift outdoor market in the town of Listvyanka, we passed at least 30 nearly-indistinguishable stalls, dozens of smoked fish piled on each, waiting for customers to buy this Siberian delicacy. The smell of the smoked fish was unmistakable: not exactly smokey, not exactly fishy, and not exactly sweet. But, like the center of a Venn Diagram, it was somehow all three at once. Eventually the calls of the babushkas won us over. Not that we could understand a word they were saying, but we realized we had to try it nevertheless. 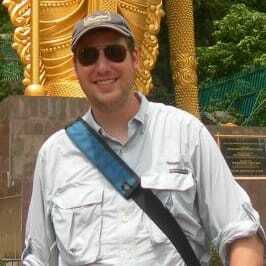 If we could handle squirming octopus or silkworm larvae in Korea, this should be easy. 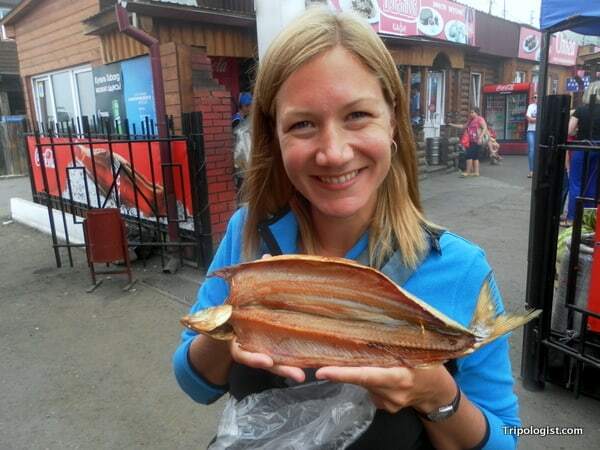 My wife, Julie, holding our smoked omul in Listvyanka, Russia. Why we selected the stall we did, I don’t know. Perhaps it was because we were standing close to it or because the babushka looked like she could use the business. Either way, we quickly picked our stall. Motioning towards our money, the woman pointed to a sign that read 60 Rubles. She handed us our fish, which was spread open with skewers like a flasher in a trench coat. Holding our omul like a sparkler on the Fourth of July, we carefully walked back through the market towards the shores of Lake Baikal. Nearing the beach, we stopped, eager to taste the region’s most famous food. As the small piece of torn flesh touched my lips, I was instantly overwhelmed with its saltiness, which quickly faded as the smokiness and then the sweetness of the fish came through. Smoked perfectly, the omul melted in my mouth like a fantastic piece of American barbecue. The taste reminded me of smoked salmon, and despite not enjoying the flavor, I found myself craving more. We walked along the calm banks of Lake Baikal as waves crashed against the rocky shore; the water so clear you could see deep into the bowels of the lake. Fighting for pieces of fishy flesh, we walked until we reached the edge of town. 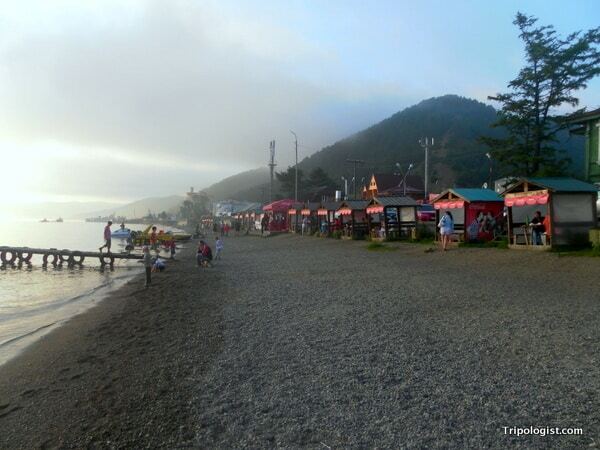 The shore of Lake Baikal in Listvyanka, Russia. With the choice of continuing our trek into the foreboding forest ahead or the welcoming beach to our right, we chose the beach. On the beach we selected from our pick of red plastic tables and chairs scattered mere feet from the lapping waters of the lake. As I sat down, I noticed the familiar cursive logo of Coca-Cola decorating the backs of our chairs. Even in this far-flung Siberian outpost, you can’t escape America. Relaxing on the beach, eating our smoked omul and drinking a cold beer from a beach-side stand, we watched as a group of local businessmen, too drunk for the middle of the day, took turns stripping off their dark business suits and running into the frigid waters of Lake Baikal in their underwear. For the first and only time during my 3 weeks in Russia, I felt like a local. 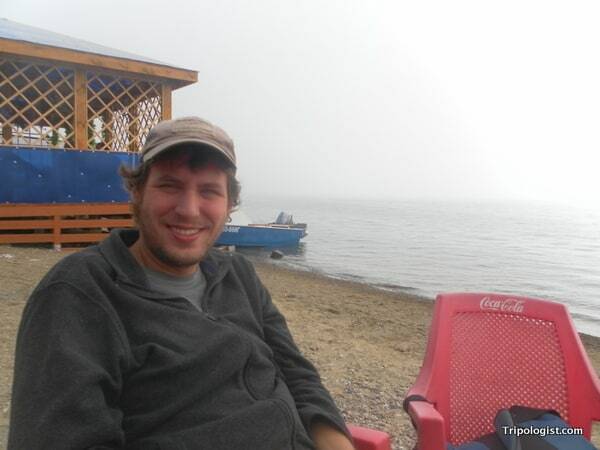 I’ll never forget my day at Lake Baikal, and I’ll never forget the taste of the smoked omul. Relaxing on the beach in Listvyanka, Russia. Oh man I LOVED the smoked Omul so much! Listvyanka is by far my favorite place in Russia. It’s so quiet, pretty and it smells of Omul wherever you go. Did you try the kebab and smoked cheese bread at that café behind you on the last picture? If not, you’ve missed out! Listvyanka was definitely may favorite places in Russia as well. Unfortunately, I didn’t have a chance to try to food at that restaurant. Gives me a good excuse to go back! Pretty see people enjoying russian nature. I did not find information about you( where u from? I am from America. Russia is a very beautiful country. I loved my time in Siberia. I’m surprised they allow gasoline powered motor boats on such a beautiful lake. You are lucky to have a wife that is willing to try foreign foods. I brought some snacks, etc, back from the UK to the US and the girlfriend at the time was afraid to try any of them. Very interesting food experience. Omul is in fact on the most delicious fish I ever tried!